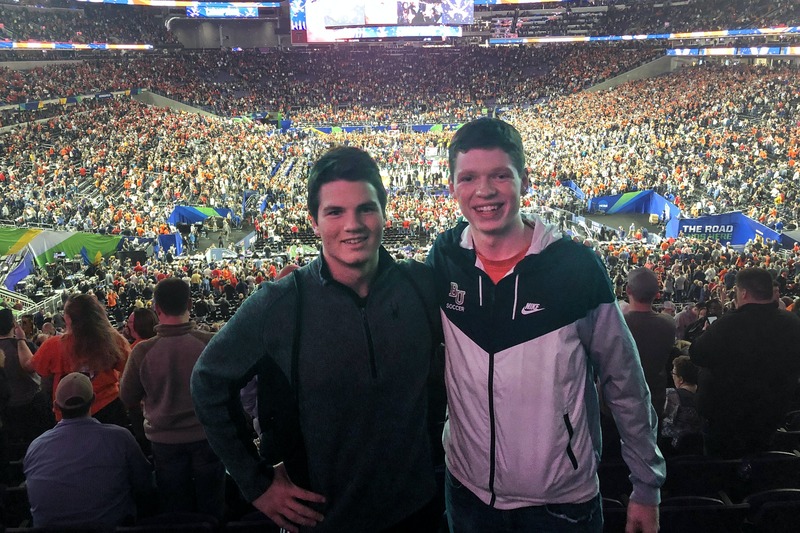 Justin Evenhouse ’22, right, poses with his brother, Henry, at the NCAA Tournament championship game on April 8 at US Bank Stadium in Minneapolis. Evenhouse is taking the Bethel course Bracketology: Competition and Controversy in College Basketball, one of Bethel’s Inquiry Seminar Courses that introduces first-year students to the liberal arts and the Christian tradition at Bethel. For his required freshman research paper, Justin Evenhouse ’22 is exploring whether high-level college athletes should be paid. To Evenhouse, the opportunity to write about his love for sports shows how Bethel sets itself apart when teaching academic skills. 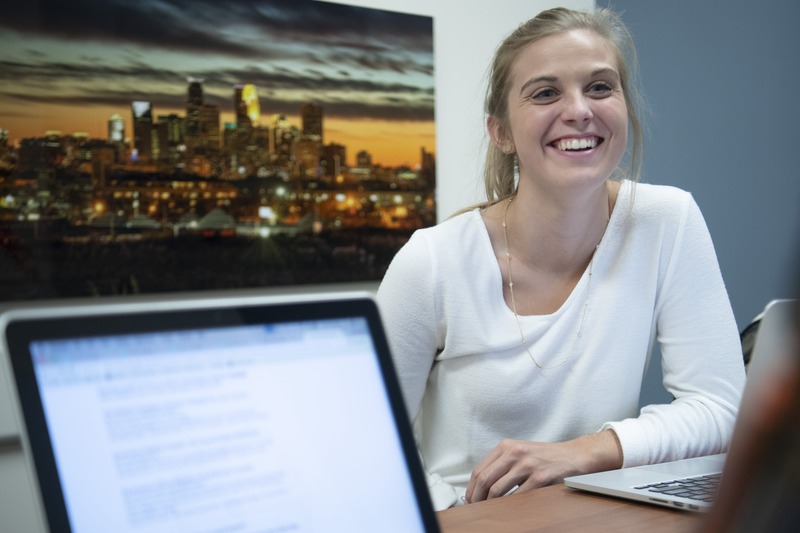 “It makes research and writing more fun, and I think more effective,” says Evenhouse, a business major with a finance and accounting emphasis. Evenhouse’s research project is part of Bracketology: Competition and Controversy in College Basketball, one of several possible emphases for the course Inquiry Seminar. Often called IQ, Bethel professors like Professor of English April Vinding have designed the class to introduce first-year students to the liberal arts and the Christian tradition at Bethel. Bethel added Inquiry Seminar, along with Intro to Wellbeing, at the start of the 2017-18 school year as part of a plan to reduce the number of required general education credits. Together, the courses show Bethel’s commitment to utilizing new, creative means to prepare students for college and life. Plus, the course addresses a challenge seen across higher education. Research shows students are not motivated to learn academic skills in general education courses when the lessons are removed from a subject of interest, Vinding says. Justin Evenhouse ’22, right, a Bethel soccer player, enjoys the Bracketology: Competition and Controversy in College Basketball course at Bethel because he can delve deeper into his love of sports while completing a required course. Bethel structured Inquiry Seminar into multiple courses built around faculty and their passions—often passions that fall outside their regular teaching load. That’s important for students to see, as Vinding says IQ shows that people pursue their careers to follow their passions. A person is unlikely to earn a Ph.D. in physics unless they truly love it, Vinding notes. Whatever you love, if it’s the Harry Potter series or sports, Vinding says it can be an academic inquiry. Professor of Chemistry Ashley Mahoney, for example, attended graduate school at the University of Kentucky and became an avid Kentucky and college basketball fan. She proposed Bracketology when she learned the Final Four would be in Minneapolis. 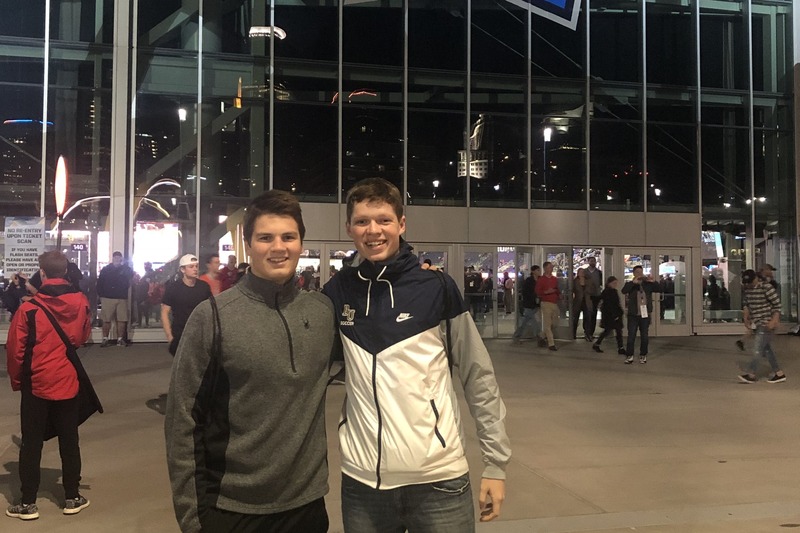 Recently, Evenhouse and several in the class attended the Final Four festivities with the tournament at US Bank Stadium in Minneapolis, and they wrote about their experiences. Though Bracketology’s focus is sports, Mahoney says her students write frequently to prepare them for higher-level courses. “The best way to get better at writing is to write,” she says. But the courses also challenge students consider different perspectives. Mahoney’s class reads “Strong Inside” about Perry Wallace, the first African-American in the Southeast Conference in the deep south. Vinding adds students work to consider their own perspectives as they explore others’ opinions. “We need to understand our own culture before we can begin to interact respectfully and responsibly with different cultures,” Vinding says. Each year, professors like Mahoney propose seminar topic ideas, and a panel selects which ones will be taught. Other topics have included: All God’s Creatures: Animals as Property or Peers, Emotional Intelligence, the Politics in Your Food, The Book Was Better?, and “Yes…And!”: IMPROVing Your Life. The classes of up to 18 students typically start with a professor modeling his or her own work. As the semester progresses, students work more independently and are challenged to ask questions, explore their curiosity, and cultivate critical thinking. “We’re modeling for them how to form a research question, how to structure a speech, how to find reliable research, how to organize an argument so that when they go into their next courses, they’re equipped to do that,” Vinding says. 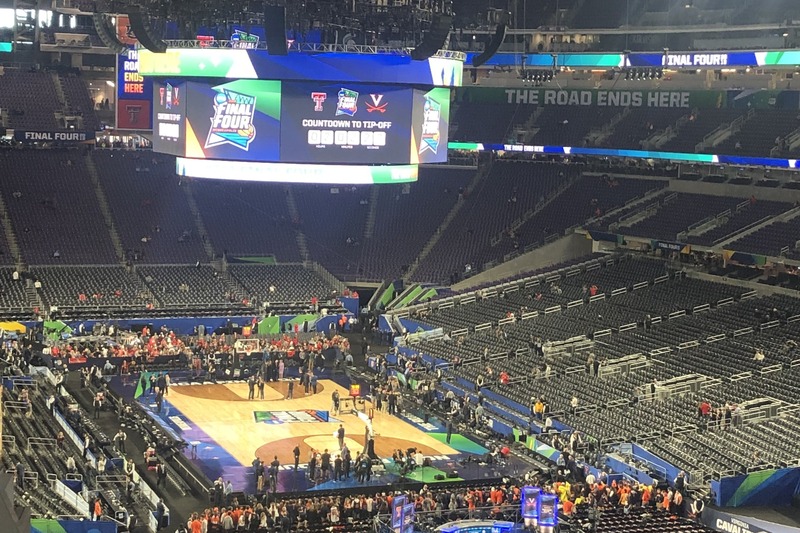 Justin Evenhouse ’22 took this photo at the NCAA Tournament championship game that saw Virgina beat Texas Tech 85-77 at US Bank Stadium in Minneapolis. 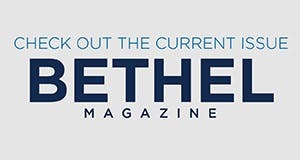 In the Bethel course Bracketology: Competition and Controversy in College Basketball, Justin Evenhouse ’22 is completing a research project exploring whether high-level college athletes should be paid. He is arguing college athletes should not be paid. Vinding compares IQ to Bethel’s Capstone courses. Capstones conclude a student’s learning experience at Bethel and begin the transition into workplaces or graduate schools. Similarly, Inquiry Seminar transitions students from their high school learning styles and life into the research and independence of college. And faith is a vital part of Inquiry Seminar, which teaches students about the Christian liberal arts and challenges them to consider what it means to think, research, and write from a Christian perspective. Bethel General Education courses equip students with the skills they need to succeed in the 21st century. Students develop core intellectual and social skills—such as critical thinking, teamwork, problem-solving, and communication-that serve as the hallmarks of a well-rounded college graduate.